Would the Iceline Trail live up to the hype? This through rang loudly in my head as I hopped in my truck destined to find out for myself. Since noting its appearance in Explorer Magazines top 25 hikes in BC I had been craving first-hand validation. 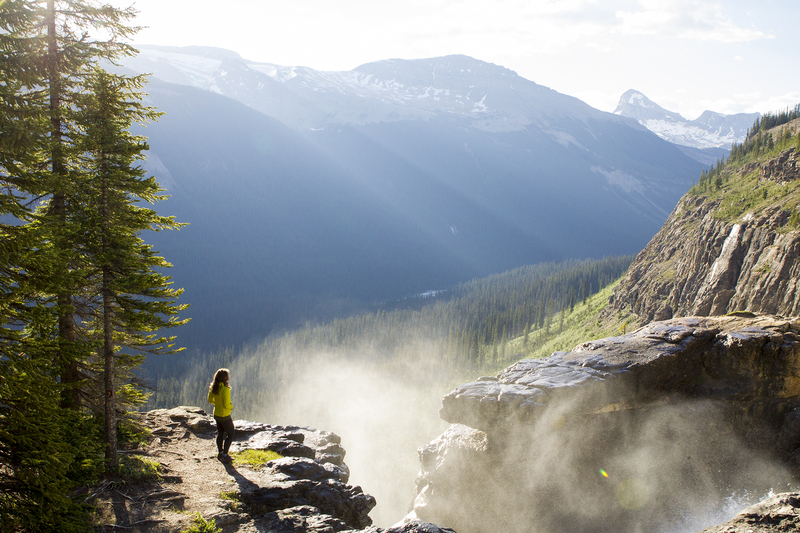 Rounding the last corner into the Yoho Valley we were greeted with a roar as the view revealed Takkakaw Falls. Plunging over a stunningly steep rock face for 254 meters before crashing into the boulders below demanding my attention. We were off to an impressive start, we hadn’t even laced up our hiking boots and I was already gawking. Parking nearby we skirted the falls and snuck in a few impressive views before going up. Our climb began at the trailhead adjacent to the Whiskey Jack Hostel. Our fresh legs welcomed the nearly 400 meter climb and it was quickly earned. Traveling through well defined historic avalanche paths we were offered peak-a-boo’s at Takkakaw Falls across the valley giving us an elevation reference point, as we soon were taller than the falls themselves. The subalpine wandering was short and sweet which was perfect as we craved those alpine views. With each step, a bit more of the towering peaks above would come into view and soon we were in it. All the glory of the Iceline Trail revealed itself to us. A moonscape of moraines and boulders was contrasted by smooth recently unglaciated rock. Hanging just out of reach was the Emerald Glacier glacier. Its retreat has carved a giant staircase of stone. Crossing the first of many creeks trickling down from the glacier we stopped to splash our faces in the cool water. Seeing the trail traverse past turquoise glacial tarns, near more glacial features and gain moraines made our jaw drop. Ok – I’m convinced this is a top ten hike for sure. Carrying on we had to remind ourselves to close our mouths, jaw-dropping sights in all directions. Above were the iconic peaks also viewable from Emerald Lake Lodge by the names of The President, The Vice President, and Michael Mountain. In the distance Yoho Mountain and across the valley the Waptiuk icefield and iconic Mount Balfour stared back at us. Walls of blue ice lingered just uphill from our path and freshly silted rock under our feet. Taking advantage of each viewpoint made it feel as though we had thoroughly explored the Iceline Trail. as we neared the end an option presented itself. 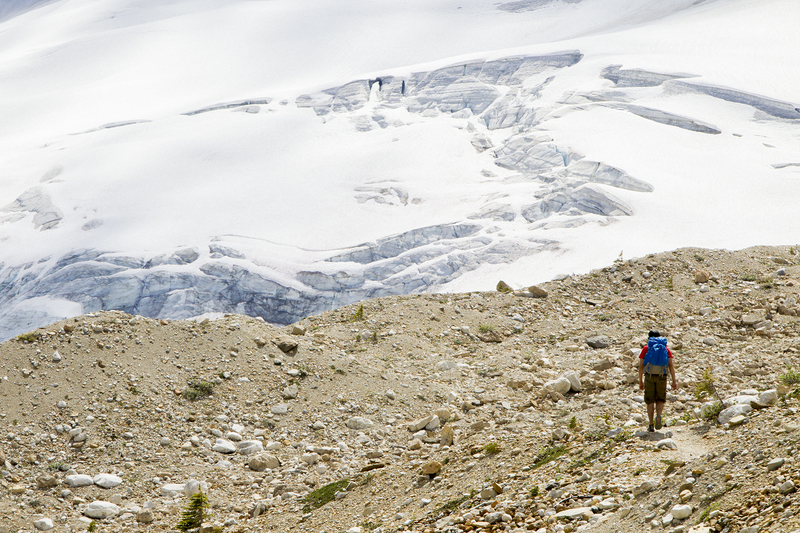 To summit the trail and continue towards the Little Yoho River or to descend into the beautiful alpine meadow below. Note this is decision-making time. Day Trip: summit the Iceline Trail and return on the same route for a 13km there and back hike. Long Day: summit the Iceline Trail, then on your return at the alpine meadow junction create a looped by taking the Junction down on the Celeste Lake Trail to the Little Yoho Valley Trail and finish on the Yoho Valley Trail. 20km loop. Day: skip the Iceline Trail summit and at first meeting the alpine meadow junction head down here towards the Celeste Lake Trail to the Little Yoho Valley Trail and finish on the Yoho Valley Trail. 17km loop. Two Day: summit the Iceline Trail, descend the Celeste Lake Trail to the Whaleback and finish on the Laughing Falls/Yoho Valley Trail. 30.6 multi-trail loop. Twin Falls Chalet – reservations must be made before June 15th yearly. We opted to see it all. 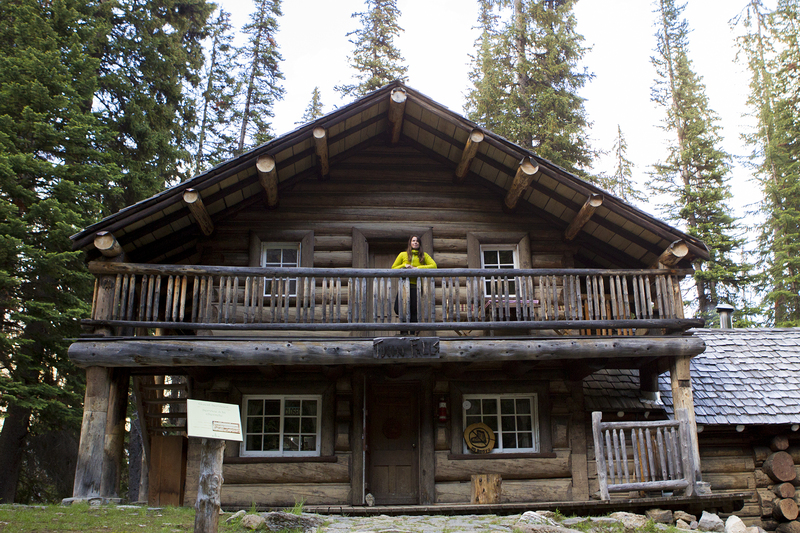 With reservations made prior to June 15th, our sleeping destination was the Twin Falls Chalet. Stalling in the wildflower engulfed alpine meadow for a snack and to kiss the alpine adieu for the day we carried on to the Celeste Lake Trail. Equally impressive in emerald green the lake warranted a stop before descending again to the Twin Falls junction. Playful bridges broke up the down and the boulder field crossing alarmed us that we would soon be at our destination. A charm so cozy and authentic we felt right at home under the raging Twin Falls waterfall. Our gracious host Fran Drummond enlightened us on the history of the Chalet and cooked up a braggable feast for our famished bodies. Lulled by the waterfall we slept soundly. Rising before the sun we get set to take in the sunrise from the top of Twin Falls by conquering the first half of the Whaleback Loop. Mist amplified the suns rays as it poured over the Daley Glacier across the Yoho Valley – could I be in a more magical place? Definitely not. Knowing that coffee and breakfast would be waiting we polished the Whaleback and arrived back to the Chalet just in time. To bring our Iceline Trail full circuit we descended with full bellies down the trail to Laughing Falls and then onto the Yoho Valley Trail. The 4.4 km trail is equally as lush in greenery as it is in waterfalls. Making a point to stop at all the falls we still made great time on the relatively flat trail back to Takkakaw Falls, making for the most entertaining valley bottom hike in my books. So what does this hiking connoisseur say about the Iceline Trail? YES. It’s worth the hype and then some. It’s an entertaining, rewarding and completely unique hike. The Iceline Trail is rated as difficult so bring your hiking smarts with you, be prepared with comfortable and adequate gear. Lots of water, it’s a big day no matter how you tackle it, you’ll need the extra bottle and snacks for that matter. For those looking to do a similar loop please note that Twin Fall Chalet must be booked prior to June 15th and is only open for nightly guests. You can surely enjoy its beauty from hiking past it but the facilitates are for reserved guests only.